New Concept Auto Service provides quality repairs using experienced technicians and specialty tools. Every electrical system relies on your vehicle’s charging system to work efficiently. If the charging system isn’t operating up to snuff, your battery is likely not getting a complete charge, and your electrical accessories and controls aren’t receiving the full voltage they require. This is when you’ll notice unusual electrical issues like intermittent power lock operation, unusual dash warning indicators, and flickering lights. You should consider getting your charging system diagnosed and address potential alternator repair or replacement needs. For 30 years, New Concept Auto Service has been at the forefront of auto repairs and diagnosis in Overland Park, including charging systems.Our dedicated staff members are professionals at performing accurate charging system diagnosis— and alternator replacement when necessary— while setting the bar high for customer service in Johnson County. At New Concept Auto Service, an ASE-certified master technician will be the one to diagnose your electrical and charging system concerns, including all alternator repair and replacement needs. We know exactly what it takes to determine the precise fault with your domestic or foreign-built vehicle, whether your Acura requires a wiring repair, your Volkswagen has a bad battery, or your Chrysler needs an alternator replacement. 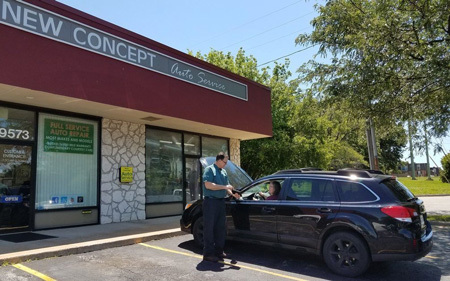 We have a wide array of professional, dealer-grade tools and diagnostic equipment to ensure an accurate diagnosis, so you won’t need to make a repeat visit for the same concern. For reliable, long-lasting repairs, we always use original equipment or high-quality aftermarket parts for alternator repairs at New Concept Auto Service. Honest. Accurate. New Concept. Call us or use our online appointment form to schedule your alternator repair or replacement today! At New Concept Auto Service, you can rest assured that an ASE-certified technician is working on your alternator repair. We have the expertise and training to repair any concern that pops up, from fluid leaks to worn out parts. We perform Alternator Repairs on all domestic and import models, regardless of the vehicle’s age. We have the necessary diagnostic tools and the repair technology to efficiently and accurately perform your alternator repair right the first time.